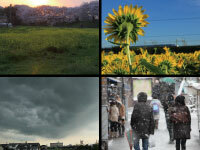 The four seasons is clearly visible whatever it may call it, if it is called the feature of the weather of Japan.It is a mistake although there are those who often mistake saying "The four seasons is peculiar to Japan." The four seasons certainly exists also in what country, as long as the earth rotates. However, since the difference carries out it being unclear, and being always hot, or being cold, it cannot say meteorologically, "There is the four seasons." There are climate zones, such as the Torrid Zone and the Temperate Zone, in the earth, and, in almost all countries, the country belongs in one climate. 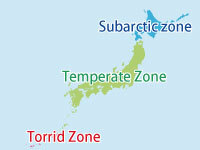 However, since Okinawa, and Minamitorishima Island and Iwojima are extended in the Torrid Zone, Honshu is extended in the Temperate Zone and the country is extended north and south like the subarctic zone in Hokkaido, Japan belongs to three climatic zones in one country. Therefore, in southern Okinawa and north Hokkaido, climates completely differ.Such a feature is seen by only China and the United States which have a large country elsewhere. Moreover, by the Pacific Ocean and Japan side, the weathers differ greatly bordering on the mountain range which traverses the center of the Japanese Islands in Honshu.